LOUISVILLE, Ky. – Mike Marra's playing career at Louisville ended last September, when he blew out his knee for the second time in two seasons. But his contribution to the program is perhaps more vital now than when he was a spot shooter off the bench. A student assistant coach, Marra is in charge of charting Rick Pitino's most cherished statistic: deflections. Every time a Cardinal tangibly impedes the other team's offense – by tipping a pass, blocking a shot, making a steal, swatting a dribble or grabbing a loose ball – Marra dutifully credits that player with a deflection. This is the hustle meter the 60-year-old Pitino created half a lifetime ago, as the young head coach at Boston University. 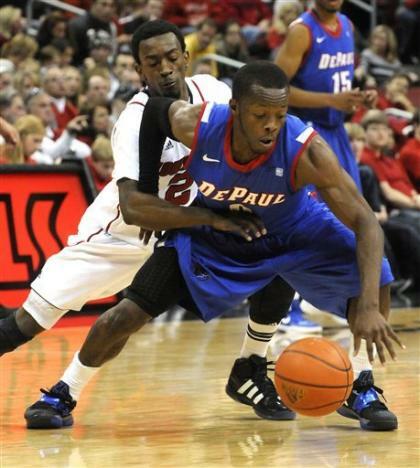 He took it with him to the NBA, then back to college, then back to the pros, and back to college again. As the game has evolved and changed in countless ways, dedication to deflections has never changed with Pitino. Deflection totals provide the objective data that answers a subjective question: How hard are you playing? The higher the deflection totals, the more active the defense. The more active the defense, the harder the team is playing. And if there is one hallmark of Pitino-coached teams, it is an almost religious fervor for maximum hustle. They simply never relent, as Sweet 16 opponent Oregon will be the latest to learn Friday night in Indianapolis. There is a beauty to their consistent work ethic, and deflections are the most basic building block of that hard-work culture. "I can't say enough about Coach Pitino and how he gets his guys to play for 40 minutes," said Colorado State coach Larry Eustachy last Saturday in Lexington, after his Rams were run over by Louisville 82-56. "As impressive as I've ever seen. … That is extremely hard to get your players to do and a tribute to the players." It is a tribute to the motivational value in the hashmarks Marra jots down on the sidelines, one deflection at a time. You can't find them in a box score, and SportsCenter doesn't devote airtime to players with big deflection stats. But at Louisville, it is the surest way to secure playing time. Players now will yell at the bench, "I got a deflection!" They want to make sure Marra gives them credit, and aren't above lobbying him during games. "When your team is doing that, you know they have the right mentality," said Steve Masiello, a former player under Pitino at Kentucky and coach under him at Louisville, who is now the head coach at Manhattan. As the designated documenter of deflections, Marra is given a prime seat near Pitino at every game – because when the manic coach wheels around in-game barking for information, woe unto the assistant who is not prepared with an answer. At every timeout, Marra's clipboard is handed to Pitino before the Cardinals reach the huddle. There is other statistical information on the board – mostly shooting percentages and rebounds – but the numbers at the top are deflections. There is a total for the team and a player-by-player tally. "It's telling you how much effort your team is putting out on the defensive end," Masiello said. With the rise in popularity of tempo-free statistics (i.e. efficiency ratings) in college basketball, there is almost no end to the numbers a coach can have to appraise his team's performance. Some very successful young coaches, like Butler's Brad Stevens and many others, devour those advanced stats. But across 30 years at seven coaching stop, this is the data Pitino prizes the most. "People really take that mindset into a game, getting deflections," said Louisville center Stephan Van Treese. The goal for every game is 17 to 22 deflections by halftime and 35 at the end of the game. Deflection totals are written on the locker room whiteboard at halftime of every game, and sometimes are a barometer for how playing time will be apportioned in the second half. The postgame numbers are put on the board as well, and often are the first thing Pitino comments on. That's the public record for players to gauge their effort. Later on, Pitino will review the film and personally make sure the deflection totals are accurate. When the numbers were bad, the players heard about it. "You were constantly having that thrown in your face," Masiello said. When the numbers were good, the players heard about that as well. Masiello recalls games four years ago where future NBA player Terrence Williams would have a triple-double: points, rebounds and deflections. You can guess which stat mattered most to the head coach. "He would make a bigger deal about the deflections," Masiello said. Way back in the '80s, when Pitino brought the deflection chart with him from Boston U. to the New York Knicks as an assistant to Hubie Brown, he only wrote the players who had deflections on the board – not the players who had none. Brown put a stop to that. "I hear this booming voice in the back of the room," Pitino recalled. " 'Wait a second, where the [expletive] are the other guys?' He started killing everybody that didn't have a deflection. … Hubie said, ‘Put every name on the board.' "
What began as an in-game metric for hustle has since extended to practice. Pitino has managers charting deflections during drills and scrimmage situations, giving him updates every 10 minutes. As long as Pitino has been doing this, the current Cardinals might be his most deflection-hungry team of all. The coach was ecstatic when his team had a season-high 58 deflections against Villanova in its first game of the Big East tournament. But the Cardinals shattered that total with 67 in the first round of the NCAA tournament against North Carolina A&T. Super-quick, hyper-aggressive guards Russ Smith and Peyton Siva combined for 32 of the deflections, a reflection of their feeding-frenzy attacks on the ball. "Russ and Peyton, what they're doing is absurd," Masiello said. "Other teams can't make a pass without them disrupting it, and it just frustrates them so much." 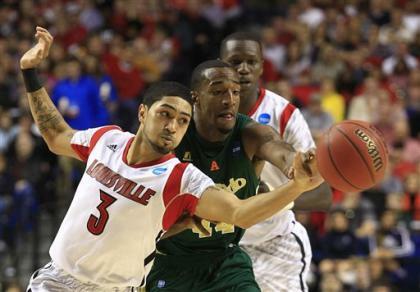 Against North Carolina A&T, Louisville broke the NCAA tourney record for steals in a game with 20. One of the two teams that previously held the record: Pitino's 1987 Providence team, led by current Florida coach Billy Donovan. "I sent Billy the Kid a text that said, 'Sorry, you no longer have that record,' " Pitino said. Donovan, of course, charts deflections at Florida. Virtually every member of the expansive Pitino coaching tree does. "I don't know one of his guys that doesn't," Masiello said. "He'd disown you."